sailboat. : Monday Lust List 014. I do these frivolous wish list posts almost every week and include things I think are cute and things that I would very much like to own. Why I want to own all these things I don't know, I mean they're not going to make my life any more worthwhile and most of the time they'll be my new favourite thing for a week and then I'll promptly forget about them. Maybe this is something that comes with age, but I've definitely learned to not make impulsive purchases but instead take the time to think about whether I need something or if I just want it for no real reason. In many respect these wishlist posts have helped me with that, if I'm coveting something I'll pop it in a post and more often than not, I won't end up purchasing. This week, with Christmas fast approaching & a mama nagging me to decide what I would like as a gift, I decided to put together a little wishlist of items that I really would like for a reason. Well, I've mostly stuck to that, there's a bit of a frivolous item or two included in this weeks wishlist - can you spot them? 1. A Canon 600D is the one item I'm currently coveting the most & it's the item from this little list that I will be lucky enough to receive. Christmas this year is going to be a quiet affair, it's just my mama & I and between us we're not exactly being weighed down with all the cash in our purses but that's okay because that's not what Christmas is about. I'm twenty two years old now and if there's something I'd really like then I'll save up and buy it for myself which is what I'll be doing with this beauty - with a little bit of help from my boyfriend and my mama. My current DSLR is almost 6 years old so I'm very overdue for an upgrade & I'm excited to start making better quality YouTube videos & hopefully selling some of my prints one day! 2 & 3. Please excuse the shoddy photoshop job I did here while compiling this list - I find removing a background really difficult sometimes! I imagine that I don't need to go into too much detail as to why I adore this sterling silver bunny ring & sterling silver bunny stud earrings from a very talented jewellery maker, Studio 59 on Folksy. The bunnies have one straight ear & one lop ear which reminds me SO much of Ralphie! If I'm lucky enough to receive a few pennies from family members this year I know what I'll be spending them on! 4. This wine sleeveless lace 'Frankie' dress from Chiara Fashion is the dress I would love to wear on Christmas Day. It's festive but not over the top at all, a really flattering shape and I'm still loving all things lace! I can't believe it's under £15! 5. I received my first bottle of Stella by Stella McCartney perfume for my birthday in May & I'm just starting to run a little too low for my liking. I could probably make the bottle last until my next birthday but I really don't want to run out because it smells absolutely beautiful! 6. This is my one ridiculously frivolous addition to this wish list but I couldn't resist. This knitted reindeer jumper is from Topshop and it costs an absolutely obscene £50! There is no way I would pay that amount of money, or ask anyone to buy it for me, but I can look and lust over it until my hearts content! Although is it just me or does it look like they've given a potato a nose, antlers & eyes? 7. My other favourite perfume is Eternity by Calvin Klein & I've worn this since I was about 15 - I still adore it 7 years later! I will never not love receiving this as a gift because it's my favourite scent ever. 8. Lastly the Vichy Aqualia Thermal Rich moisturiser is my all time favourite and since I'm such a skincare geek opening this as a gift would be amazing! I think this will be the other item I purchase if I'm lucky enough to get a little bit of Christmas money this year, it just feels so beautiful on the skin - worth every single penny! Do you have anything in mind that you'd like for Christmas this year? I would love a new camera or maybe even just a lens..so expensive though. I adore that dress, super cheap too! I too want that jumper (but I'd prefer the penguin one) but agree that it's ridiculously priced. Strangely enough, I've never smelt 'Eternity' even though it's been around for years. I'm intrigued. The lace dress is the perfect Christmas dress! I am still yet to buy an outfit for the special day! I completely agree with you about making wishlists and finding out what you really want :D Ever since I received my student loan I've been quite stingy and made barely any impulse buys. Being given loads of money seems to have calmed me down and really made me think about the difference between wanting and needing. A new camera, that's so exciting! I love the dress, it's absolutely gorgeous. Aww that jumper is so cute, but the prices in Topshop are ridiculous lately. Also been a great fan of Eternity for years, but I've run out a few months ago! Oh my goodness that dress is an absolute bargain! It's super cute too. I hate myself for spending so much money on the penguin version of that jumper...but damn, I love! The bunny jewellery is so cute! I remember seeing that jumper on the Topshop website last week and I couldn't believe the price of it! I liked it, but not enough to spend £50 on it haha. All I've got on my Christmas list so far is perfume and a couple of DVDs - I'm finding it hard to think of anything that I actually want/need! My sister wants a Christmas jumper, the reindeer one looks perfect but you're right - too expensive!!! 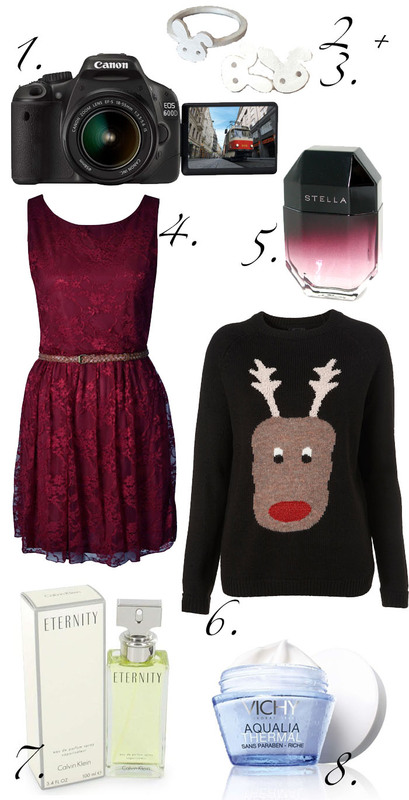 Mmm I am really loving that wine color for this cold-weather season...and that reindeer jumper is so adorable! New Post: Sweet Necklace + Library Bag Giveaway! --Help me spread the word!! That Reindeer jumper is so cute! Love the little bunny ring it's so cute, just been browsing the shop there are so many cute things :) Also love the reindeer jumper, but you're right the amount is ridiculous!